Everyone loves a good face plant. They are kind of like a car wreck that you can’t turn away from. You watch the video clips in anticipation, not really wanting to see it, but you cant pull away. The video clips often come in the form of a dude on a bike trying some unrealistic acrobatic slide down the railing of some concrete stairs, he makes it down about halfway before something goes horribly wrong and he ends up eating concrete and sliding face first for several feet. We all watch, cringe, hunch over and yell out, “ooohhhh”, and then bust out laughing and being super grateful that we weren’t the poor sucker that will have road rash on his face for 8 months…..then we watch another one, and the process repeats itself until our stomach starts to turn. We all love them, because in one way or another, we have all had a face plant or two. We can relate to the feeling of using our nose like sidewalk chalk. Ive done it twice. 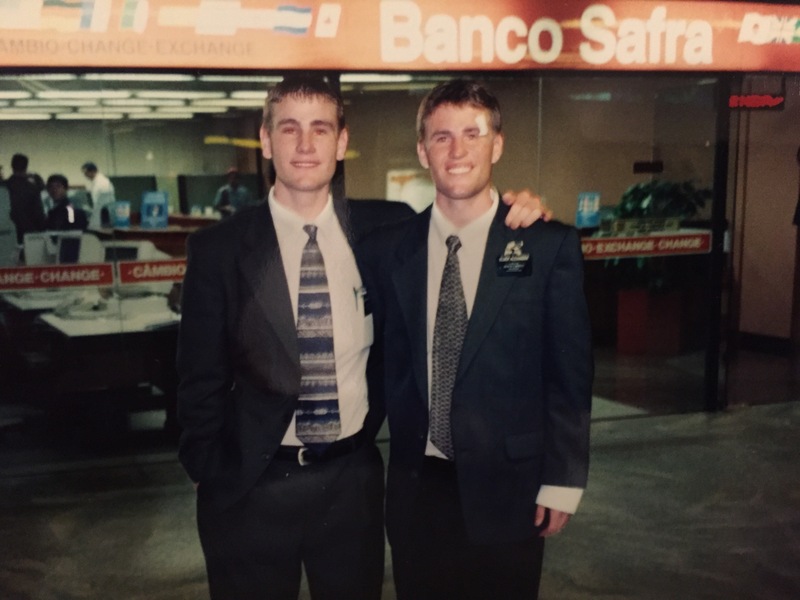 The first story occurred back in Brazil while on my mission. It was the last day in the country before boarding a flight to come home. It had been raining for most of the morning, which wasn’t a huge surprise, but the rain had left huge puddles in the road. My whole district, a group of about 12 guys, had met up at the office and were on our way to the president’s house a few blocks away for a big celebration lunch. It was going to be awesome. We were all super pumped about seeing each other again after the 2 years in Brazil, and we were going to go have some seriously awesome food at the presidents house. This is where the drama unfolds. The aforementioned puddles in the road? Yes, these turned out to be a huge obstacle in our 3 block walk because the sidewalk was right along the road, and the Brazilian bus drivers show no mercy. As a side note, Brazilian bus drivers think that using the clutch to shift while driving is an unnecessary act, that only slows them down. So, seeing a pack of Mormon missionaries walking clumped together about 18 inches away from a 14 foot puddle in the road was certainly no reason to slow down. Can you see where this is going? So, Imagine all 12 of us walking along this wet, 5 foot wide sidewalk, rubber shoes, 14 foot puddles, speeding busses, and of course, the star of the show, a metal guardrail post. When it all went down, I happened to be walking right next to one of my favorite elders, who looked and acted a lot like Chris Farley. We were just coming up on a massive puddle, and we saw a speeding bus screaming around the corner towards us, I think upon seeing us, the bus driver may have actually sped up, and likely swerved a little closer to the sidewalk in order to completely shower every one of us in our white shirts. Me, being the ever vigilant and aware guy that I was, saw this coming and peeled out in my modified sketcher shoes, who’s soles had been replaced with actual tire rubber. I was first out of the blocks, and was on pace to make it to the other side of the puddle before the shower of dingy, oily, grimy, stinky water could ruin my day. Then, Elder Chris Farley (not his real name) happened. He was rotund, and not especially sound in his sprinting technique. His arms and legs were flailing well outside of his designated lane. His poor technique mixed with a rather narrow sidewalk, wet ground, and 10 other scrambling Elders was a perfect storm for what happened next. After about 5 or 6 full speed strides, his right leg, and rather large foot reached out and grabbed my entire left leg and stopped my perfect sprinting form in its tracks. I went down. Not only did I go down, but I went down hard, I was in full stride, running like my life depended on it. My leg had been taken out by Chris Farley. Time slowed down, as I saw what was coming. I reverted back to instinct. All my years of baseball had prepared me for this one moment. I had just enough time to raise my arms and perform a perfectly executed Pete Rose dive and slid along the wet cement as fluidly as if it were a slip-n-slide. It was a thing of beauty…..until the guardrail. About 7 feet later, I met the guardrail….with my face. My hands were doing their best to keep my face from becoming part of the sidewalk, so I was helpless. All I could do was close my eyes. I hit with the force of a rhino. Im sure kids in Texas came running for supper after the sound of that dinner bell as my cranium nailed that post. It was epic. I then spent the rest of the afternoon bleeding, and cleaning small bits of gravel out of my hands. My suit was ripped, I tore my shirt to bits. It was awesome. It was the very epitome of a graceful Face plant. The second story comes a few years later, while we were living in California during school. My son had just received one of those Razor scooters for christmas, and I was showing him how awesome they were. He was about 4 years old. I was obviously dressed appropriately for action sports in my shorts, and flip flops. Nothing could go wrong right? Well, I was due for another wipeout. This one was also not my fault. As I was showing him how to ride out on the asphalt parking lot, a little pebble, probably put there on purpose by someone who was jealous of my Razor skills, nearly ended my life. That little pebble, against the small scooter wheel, won. The scooter stopped immediately. I, however did not. The look in her eye said it all. I was her hero, for a few minutes at least. I had survived a possible subdural hematoma and 8 weeks in the hospital eating through a straw, all because of a pebble the size of pea. Don’t try that at home kids. So, what do these face plants have to do with anything? 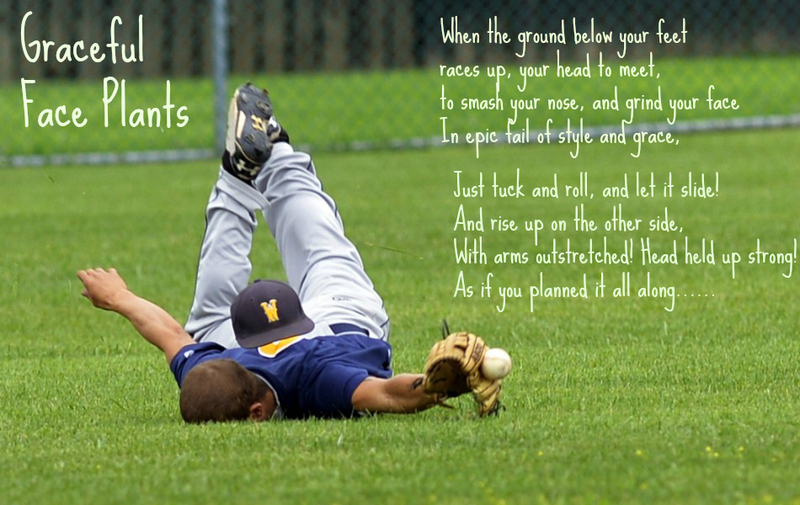 We all face plant in one way or another in our life. No one gets through without one. We have to know, and expect that we will bite the dust at some point in our lives. Its part of our learning experience here on earth. We have to expect that there may be big scary things in our lives that get in the way of where we want to go, and who we want to be. These tend to be somewhat easy to avoid, or at least easy to see coming, They may be drug use, crime, or being unfaithful to a spouse. These obvious things are like the speeding bus. Sometimes, though, even as we avoid the speeding bus, we get tripped up. And sometimes, its even because of someone we like and enjoy being around. We cant avoid it all, and we aren’t meant to. The important thing is getting up. If we can change our attitude to the point of expecting, and being prepared for our falls, we can be a lot more graceful in our face plants. Sometimes something really small, and seemingly insignificant can take us down, or at least try to. These small things can be like forgetting to pray, or read our scriptures, treating someone unkindly, or forgetting to pay an honest tithe. These can be like the pebble under the wheel. It only takes a small one to trip us up. But, if we are prepared to fall, and understand that it is part of life to do so, it helps us pop up so much quicker, and more gracefully. It is still a fall, but it happens to everyone, and we all will fall again and again. 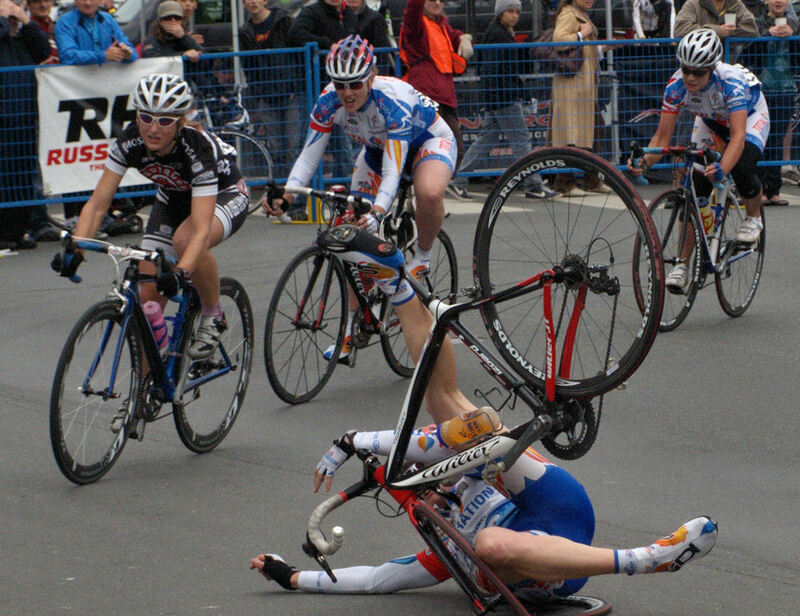 We just need to better develop our ability to tuck our head and shoulder, and roll with it, and pop back up as soon as we can..
We can learn a lot from our own mistakes and falls, sometimes its the best way. Let’s take the bad times along with the good, and learn to be more like Aaron and his brothers, and be patient in all of our sufferings, so that eventually we will become who we are meant to be.